The schedule may vary depending on the number of participants. In case of modifications you will be notified during the tournament day. We will sell snacks, tea, coffee and water during the tournament day. For those who want to shower between the tournament and the party night, we offer the possibility of using the showers and washrooms of a gym about 400 m from the tournament hall. Don’t forget to bring towels and whatever else you need. Please state your wish to shower to the tournament office desk by the end of the discofox semifinals. 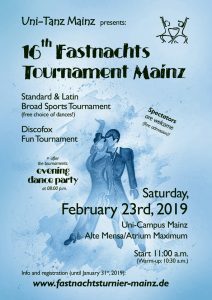 The tournament day will be followed by a cosy dancing party. Please bring your cost contribution of 5 € per person for the buffet, and pay at the box office when you enter the hall for the evening. Don’t forget to bring your own plates and cutlery! In order to make sure there is sufficient (but not far too much) food for everybody, please state the number of people you’re bringing to the party (especially if you want to bring friends, which of course is a great idea!) – there is a special field for that in the registration form.